Plagued by an undiagnosed problem that stranded it in Earth orbit, Russia's Phobos-Grunt Mars mission remained quiet Tuesday (Nov. 29) after renewed attempts to coax the craft back into contact with ground controllers. European Space Agency officials transmitted signals to raise Phobos-Grunt's orbit Tuesday in hopes it would allow greater communications opportunities at a higher altitude, according to the agency's Twitter page. The ploy didn't work, and the probe remains in a low-altitude orbit less than 200 miles (322 kilometers) above Earth. Outfitted with a feedhorn antenna designed to attenuate the power of its radio signals, ESA's Perth ground station heard signals from Phobos-Grunt twice last week. Perth's 49-foot dish antenna received limited telemetry from the spacecraft. 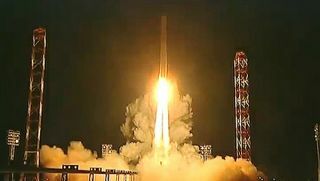 ESA passed the data to engineers with NPO Lavochkin, the probe's prime contractor. The Perth facility only has between six and eight minutes each time Phobos-Grunt flies overhead in sight of the station, providing limited windows for transmitting commands and receiving data. Officials hoped raising the craft's orbit would lengthen communications passes and give engineers a better chance of recovering the mission, but the commands didn't work Tuesday. ESA said Russia requested more orbit-raising commands to be transmitted Tuesday night and Wednesday morning. The outcome of those attempts will be known later Wednesday. Engineers are adding a feedhorn antenna to ESA's tracking site at Maspalomas in the Canary Islands. The feedhorn device was added to ground stations to reduce the power of signal transmissions because Phobos-Grunt's computers may think the craft is on the way to Mars, when radio signals from Earth would be weaker than in orbit. Phobos-Grunt was designed to release a Chinese orbiter around Mars, then touch down on the Red Planet's rocky moon Phobos and collect samples. It carries a return vehicle to shepherd the soil of Phobos back to Earth for analysis. Phobos-Grunt has been stuck in its low-altitude orbit since liftoff Nov. 8. A rocket pack attached to the spacecraft was supposed to fire twice to accelerate the probe toward Mars, but neither firing occurred as planned in the hours after launch. Without data to assess the 29,000-pound craft's health, Russian engineers were left in the dark about why the burns failed. Russia enlisted help from ESA and NASA to contact the probe, but NASA's deep space antenna in Goldstone, Calif., never received a signal. NASA's deep space network stopped listening for Phobos-Grunt on Tuesday to prepare for Saturday's launch of the Mars Science Laboratory. Because Phobos-Grunt's altitude is so low, experts say the fuel-laden craft will succumb to the affects of drag and fall back to Earth early next year. Nicholas Johnson, NASA's chief orbital debris expert, said the re-entry may occur in late January or February, but a specific time period won't be known until much later. If Russia is unable to regain control of the spacecraft, it would plunge into the atmosphere uncontrolled with a full load of propellant.